Preheat the oven to 400°. In a large bowl, cover the bulgur with the hot water. Cover the bowl with a plate and let stand until the water has been absorbed and the bulgur is tender, about 20 minutes. Meanwhile, on a large rimmed baking sheet, drizzle the zucchini, carrot, onion and bell pepper with 2 tablespoons of the olive oil. Season with salt and pepper and toss well. Roast for about 15 minutes, until the vegetables are slightly softened; let cool. Fluff the bulgur with a fork. Stir in the tomato paste. Fold in the roasted vegetables, lemon juice, cucumber and the remaining 2 tablespoons of olive oil. Season with salt, black pepper and crushed red pepper. Serve at room temperature or slightly chilled. 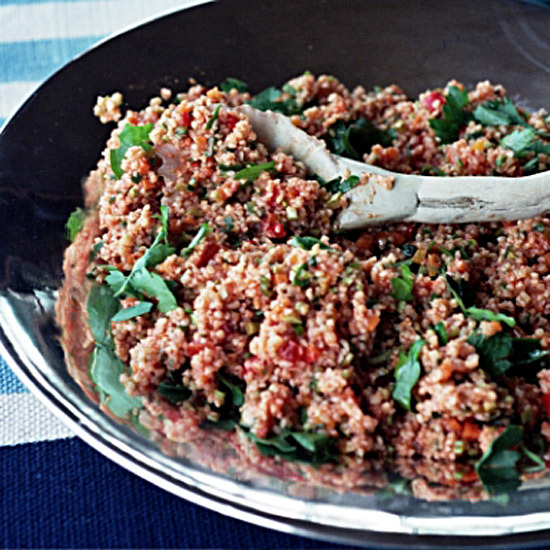 The bulgur salad can be refrigerated overnight. One serving 264 cal, 40 gm carb, 10 gm fat, 1.4 gm sat fat, 6 gm protein, 10 gm fiber.